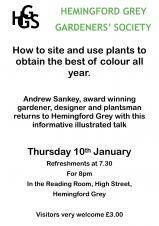 Andrew Sankey, award winning gardener, designer and plantsman returns to Hemingford Grey with this informative illustrated talk. 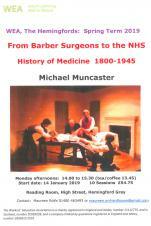 From Barber surgeons to the NHS: History of Medicine 1800 - 1945. This meeting will now take place at The Parish Centre (not the Pavilion as previously advertised) on Wednesday 23rd January at 7.00 pm. This is a public meeting and all are welcome. 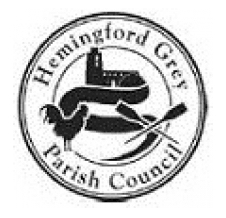 The Village Lunch is usually held on the 4th Friday of each month at the Hemingford Pavilion upstairs in the Chris Page Room (a stair lift is available). The cost is £7 and includes a main course, dessert and tea or coffee. Everyone is welcome. 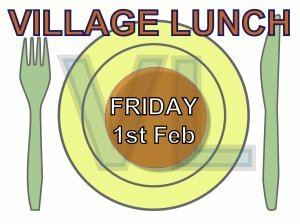 So we can provide the right number of meals please let us know you are coming preferably at least a week before the event. For more information or to book a place please telephone Margaret Gledhill on 01480 383599 or put a note through the door at 23 High Street.